The morning run of the computer models are just about in and many of my original questions/concerns remain. A couple things seem certain. The amount of moisture for the system seems to be decreasing. Models are slowing the timing of the system to Friday evening/early Saturday morning. 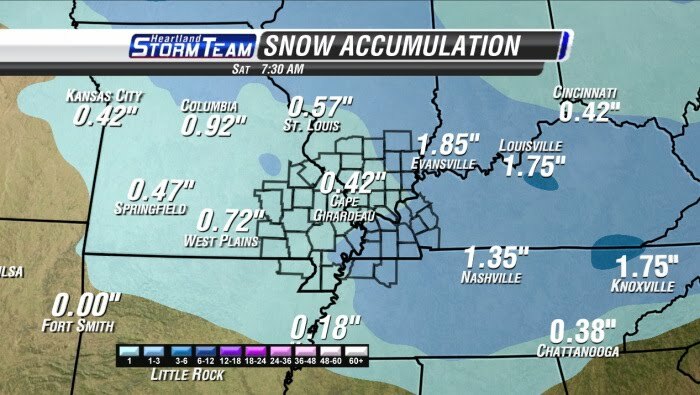 Models continue to try to split the system taking the brunt of the energy well south of the KFVS viewing area. Do I think we will see some snow out of this? Yes. How much? It is still too early to have a good feel for it. My initial thought is anywhere from a dusting to as much as 3". Here is a look at what the 12z RPM model is putting out for snowfall. Again, remember this is just numbers from a computer model. It is NOT my nor the StormTeam's forecast. The storm is currently moving onshore over the southwest United States and this evening's computer models should have even a better handle on the storm. 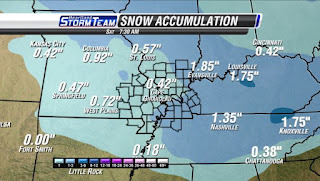 From now until Friday each run of the models should begin to make the picture a little clearer. Similar to using a camera and having it be out of focus. As you slightly adjust the focus, things begin to get more clear. Each run of the 0z and 12z runs will begin to make focal adjustments. I'll try to update later tonight. 10:00pm Weather Update - "It's as cold as ice"
7:00pm Weather Update - Want some ice with that?